The Sonic Maximizer restores natural brilliance and clarity to an audio signal by the use of two integrated functions. First, it adjusts the phase relationships between the low, mid and high frequencies through adding progressively longer delay times to lower frequencies, creating a kind of mirror curve to neutralize the effect of loudspeaker phase distortion. Second, the Sonic Maximizer augments higher and lower frequencies as loudspeakers tend to be less efficient in their extreme treble and bass ranges. The end result is a dynamic, program-driven restoration which reveals more of the natural texture and detail in the sound without causing fatigue that is often associated with exciter effects, psychoacoustic processors or excessive use of equalizers. The Series 282i family of Sonic Maximizers offers a unique compact form factor which makes them perfect for smaller DAW workspaces, DJ systems, guitar/ bass guitar amps or desktop playback. Actually, anywhere 19” rack mount space is limited. The all-analog 282i incorporates the same great, patented BBE circuit that’s used in our rack mounted 882i Sonic Maximizer processor. These three versions allow you to choose the 282i that’s best suited to your particular sonic requirements. 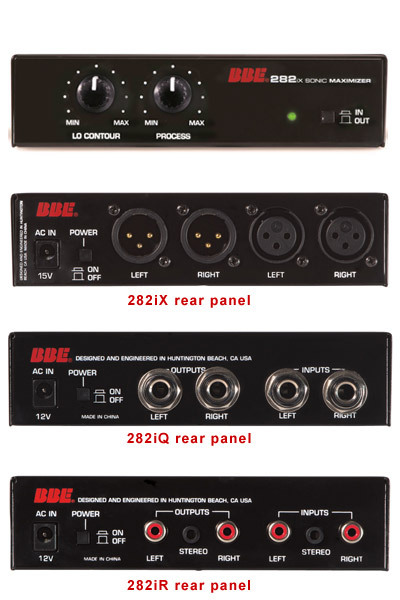 Now there’s no excuse not to upgrade your sound with BBE!